It is Wednesday, which means time for DT's favorite hump day game -- also known as Mid Week Match-Up. As the leaves fall from trees (not out here in California, we don't really have seasons...but I visited the great state of PA the other day and autumn was gorgeous!) we need to prepare for WINTER...so, it is time to pick your favorite winter vehicles. GO! 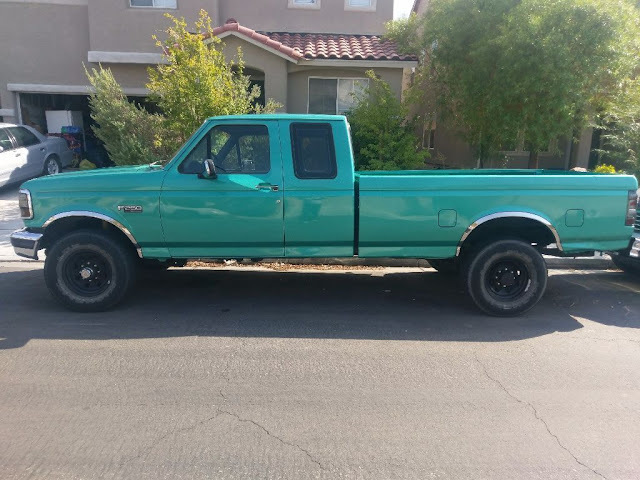 I just want something truckish and 4WDish...like this 1992 Ford F-250 XLT offered here on eBay bidding for $500 reserve-not-met with $6,500 buy-it-now located in Las Vegas, NV. What do you suggest? Comments below. Drat, still haven't figured this out. Found a decent little Toyota minitruck that should do nicely. The diesel can be a little hard-starting when cold, but that what core heaters are for. While recognizing that the little Jeep gets studded snows and the F250 crewcab/longbed does not, it is an easy choice on which to take on snowy and slippery days. As a life-long resident of the rust belt, pretty much every vehicle I've ever owned has melted away before its time. Sure, I've let a few go due to mechanical issues, but most succumbed to the tin worm. 4WD and truckish is a reasonable strategy (though Fueltruck is right about pickups on snow-covered highways, plus, an open bed fills with snow which becomes glacial after a few freeze/thaw cycles) but it would be bordering on criminal to subject a nice, clean older truck to a salty death. What you need is what we call a 'winter beater'. Reasonably common, reasonably reliable, pre-rusted and cheap. Make sure it has good tires, a good battery, and a good heater. Run it for a few winters and then find another one.